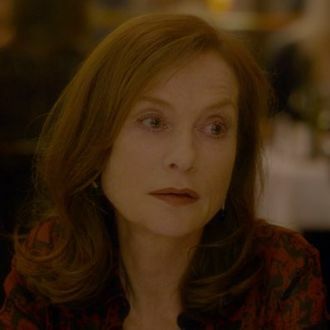 This year’s potential Best Actress lineup is already bustling, but after watching Isabelle Huppert’s astonishing work in Elle, it’ll be hard not to root for the never-nominated French icon to make it into the final five. In this Paul Verhoeven–directed dramatic thriller, Huppert plays Michèle, a successful video-game baron who is raped in the film’s startling first scene. The matter-of-fact way Michèle handles this assault leaves her friends gobsmacked, as you’ll see in the exclusive clip below, but Michèle is a complicated woman whose calm hauteur hides plenty, even as her demeanor leaves others reliably rattled. Elle is a high-wire act that’s simply inconceivable without Huppert’s steadiness. While Verhoeven has never been afraid to push the envelope — this is the man who directed Robocop and Showgirls, after all — Huppert keeps the film grounded through every provocative new move as she cannily underplays Verhoeven’s black humor. You’ll get a taste of all that in this scene from the film, which debuts in limited release this Friday.